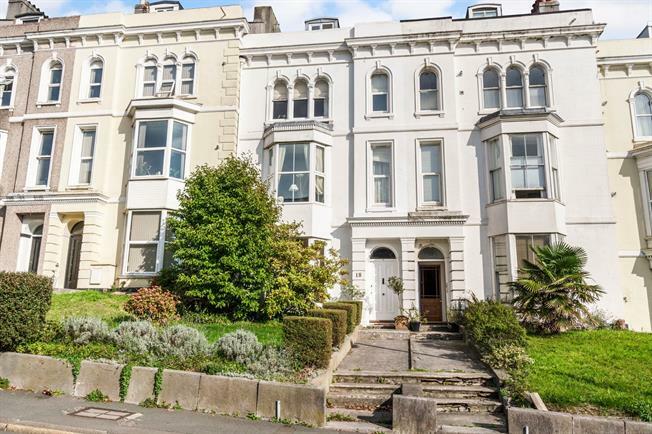 4 Bedroom Terraced House For Sale in Plymouth for Offers Over £550,000. Centrally located and steeped in character is this impressive and unique four storey period property. Many of the period feature still remain including coved ceilings, ceiling roses and Marble and slate fireplaces. The house has been divided into three self contained flats and a maisonette which has the use of the entrance level accommodation. Secure off road parking, water views and a walled rear garden. This impressive and unique period property is circa 1860 and still retains many of its period features. When entering the property you are greeted with a wonderfully inviting entrance hallway with turning staircase servicing all floors. The house has been divided into three self contained flats and a loosely arranged maisonette apartment which has the use of the accommodation on the entrance floor. Each flat offers a private kitchen and bathroom facilities and are currently being occupied. Under-floor heating in the kitchen and breakfast room and brick paved parking to the rear with an electric roller door. Walled rear garden stocked with a fabulous selection of plants including a mature horse chestnut, virginia creeper, crab apple tree and hibiscus. The property will lend itself for further development or the opportunity to return to one dwelling subject to the relevant planning permission.